"Children are like sponges – they absorb so easily. They are at an ideal age when they can be moulded into what they want to be. They have an intricate native intelligence and spontaneity that as elders we tend to lose. Today's schools do not help children to develop their inherent skills. There is no space for creativity and imagination in our curriculum. A child's imagination is least rewarded at school. They are afraid to be different from others. Infact they have become resident NRI's – they watch MTV and ape western culture... not wrong in itself, but they are losing their "racial memory", they don't know the "stories of yore", they have lost their link with the past. We do not allow our children to dream. That is why many adults these days quit their professions and take up their passion as a vocation. In order to stimulate their latent talents, I conduct workshops that stimulate imagination and creativity. Since children like listening to stories, I intend to develop harikatha in English. My programmes are packed exclusively for young minds – fun, stimulating and thought-provoking!". A core team of trained ADT dancers, take the joy of movement to school children, creating a new medium for inculcating confidence, self-awareness and pride in India's cultural heritage. 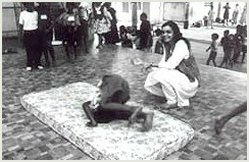 Anita's Cultural Outreach programmes also include housewives / corporates / professionals / marginalised groups. 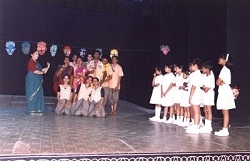 As a beginning, a special students' nodule of Arangham's full-fledged dance theatre performance, Daughters of the Ocean was presented in three exclusive shows for Chennai's schools between September 2nd - 4th, 2000 at The Museum Theatre. 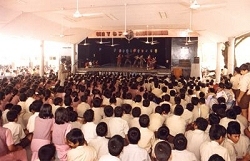 The overwhelming response saw students actively participate in the post performance discussion as well as join in a competition to give their impressions of the work through a poem, painting, essay or story. The first and second prizes went to students from Padma Seshadri Bala Bhavan School. When we found out that this production involved Anita Ratnam, we assumed that it was going to be a dance concert. Boy! Were we in for a major surprise! 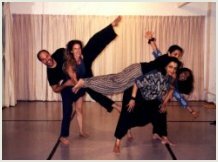 Anita and her three colleagues created a new form of dance with Bharatanatyam, ballent and yoga. The outcome - fantastic, awesome! We were all mesmerised by the performance... awestruck by the unusual style of movements, the costumes, the " rain stick" , the " ocean drum" ... the sounds of nature. We left the theatre silent, feeling we had experienced something so special that we could not even discuss it amongst ourselves. From the reactions to " Daughters of the Ocean", Anita Ratnam decided to go ahead with a show only for student audiences and planned SUVVADU for October 2nd 2000, on the 111th Birth Anniversary of Mahatma Gandhi. Here too there was an open invitation to students to react to the work with the topic" WHAT 3 STEPS WOULD YOU LIKE TO TAKE IN YOUR LIFE AND WHY?!" The audience feedback to the October 2000 show at The Music Academy was so enthusiastic, that the show got invited to visit two schools and was presented in their auditoriums. 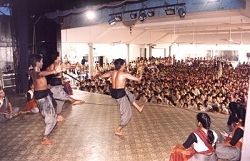 On November 10, 2000, SUVVADU was presented for the two branches of Padma Seshadri School, Chennai. 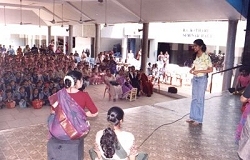 Again on Dec 11, 2000 SUVVADU was presented at Sishya School, Chennai. Later, you wouldn't want to be a repenter! And also three by words, it did, yes siree! The programme was awesome and brilliant! It was a musical, emotional, comical extravaganza! At the end of the show, I found a few tears trickling down. It happened unconsciously! I never knew I had this sensitivity in me. It has helped me see a part of myself that I knew for sure was not a part of me. It has helped me feel whole and I mean every word I say.